Your favourite stone-fruits in one fabulous collection. Cherry Stella: Unlike most other sweet cherry varieties, it will thrive in slightly exposed locations but can also be grown in a pot on your patio. The sweetly flavoured dark-skinned, plump and juicy, aromatic fruits will be ready to pick from mid late July each year. Nectarine Fantasia: Not only is it tough and hardy withstanding the worst of winter weather but it reliably produces delicious bright red fruits in British summers. 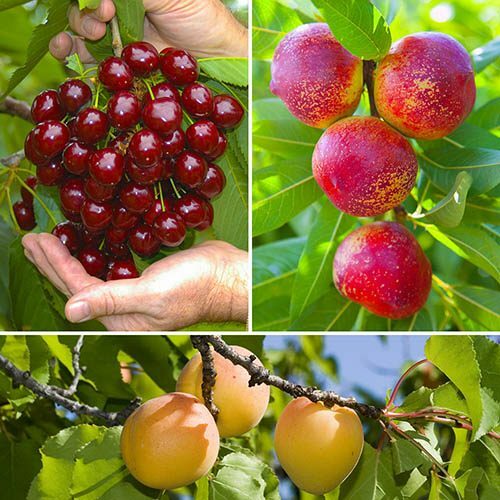 Grow three of the tastiest, juiciest stone fruit trees in your own garden and pick an abundant crop of delicious cherries, nectarines and apricots from your own patio. These top-quality, stone fruit trees produce full-sized crops in your garden or even in pots on your patio, so now anyone can grow their own fruit trees, even when space is limited. Nectarine Fantasia: Not only is it tough and hardy withstanding the worst of winter weather but it reliably produces delicious bright red fruits in British summers. Fantasia is self-fertile too so you'll not need to worry about pollination. Apricot Hungarian Best: Produces large, golden-orange fruit, with a lovely sweet and juicy flavour. One of the hardiest varieties making it perfect for growin in the UK. <?xml:namespace prefix = 'o' ns = 'urn:schemas-microsoft-com:office:office' />Add Rootgrow Mycorrhizal Fungi to give your plants a head start and establish faster. Apply a slow-release fertiliser such as blood fish and bone in early spring, and mulch to retain moisture. Drape netting over cherry trees to protect the fruit from birds. A heavy crop of plums should be thinned to prevent branches from breaking under the weight.